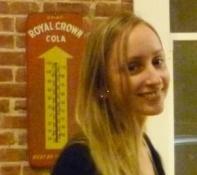 Ruth Baumann is an MFA student at the University of Memphis, & Poetry Editor of The Pinch. Her poems are published or forthcoming in birdfeast, elimae, Ilk, PANK, Revolution House, Thrush Poetry Journal, Timber & other journals. She attended the Squaw Valley Community of Writers Workshop in 2012. Language is the first animal we pull out of one another. Do we have to talk about the men I've kissed like flat soda? The men that've wrapped around me like appetite? Tell me why so much of the universe is necessary. The grammar of this winter is sharp, tense. It tries to create rules which are little ways to die less slowly, but you knew that. Elsewhere, a woman sleeps with dead planets in her eyes. Each morning I resolve to not be her. I say this until I become the tongue. Skin is not the largest organ, art is. But this does not make people any less separate. When I began to understand there was nothing to hide behind, I did not exist on a new plane. I did not learn the names of any constellations. Knowledge is never news, it just feels like it.